Registered in the summer of 1969, Chassis number 119/165 stayed with its first owner for over 30 years and since then has been maintained fastidiously with a thick history folder containing all of the receipts and paperwork that you would expect going back over 25 years. Finished in a metallic blue with a silver roof (a signature feature on the early cars) the car keeps its beautiful original black leather interior and walnut fascia. Also offered as an option included in the price is a full repaint in a colour of your choice. Please see the additional images for suggestions although the ultimate decision is yours. On the road this FF is sure-footed and pulls well. The extra weight over the front wheels on the FF models avoids any vagueness in the steering at higher cruising speeds whilst the engine being mounted behind the front axle to make room for the front differential ensures that it’s not ‘nose-heavy’ through the corners. All round this car is superb. The condition is beautiful and the drive is even better. An extremely good example of a rare and interesting GT car. Launched in 1966 the Jensen FF was the first non all-terrain production car equipped with four-wheel drive and an anti-lock braking system; the Dunlop Maxaret mechanical anti-lock braking system had previously been used only on aircraft, lorries, and racing cars. The letters FF stand for Ferguson Formula, after Ferguson Research Ltd., who invented the car’s four-wheel drive system. 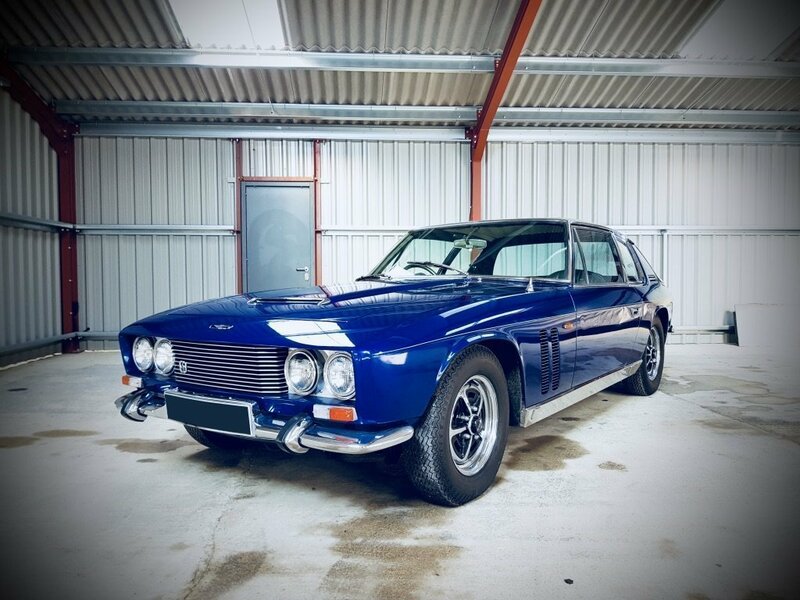 The FF is related to the similar-looking, rear-wheel drive Jensen Interceptor, but is 127 mm (5.0 in) longer, and mechanically very different. Powered by the bomb-proof Chrysler 6.3l V8 the FF also performs as well as it looks. A true piece of automotive history and in our eyes the ‘halo’ car of the Jensen range.